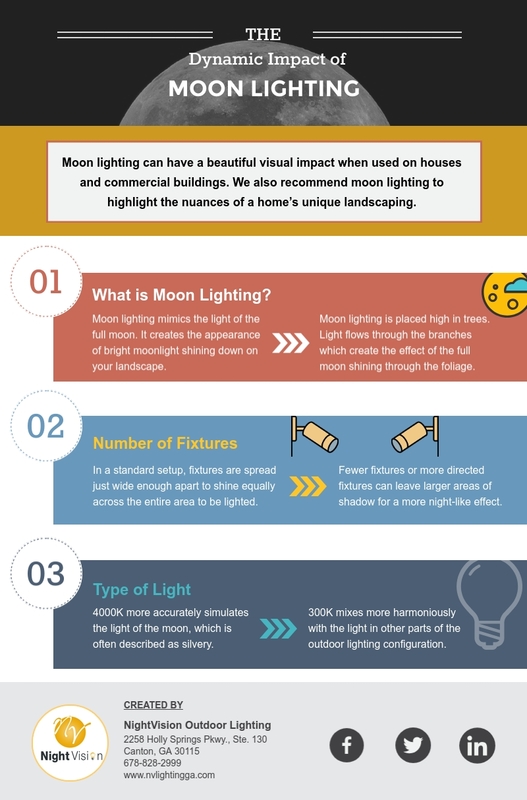 The Dynamic Impact of Moon Lighting | What is Moon Lighting? Night Vision Outdoor Lighting is a company specializing in Atlanta lighting design. One technique our specialists use is moon lighting. Moon lighting can have a beautiful visual impact when used on houses and commercial buildings. We also recommend moon lighting to highlight the nuances of a home’s unique landscaping. Night Vision Outdoor Lighting provides Atlanta lighting design for homes, commercial buildings, and landscapes. We use only the highest quality LED lamps and fixtures. Our dependable and knowledgeable service is the result of over 5,000 completed projects in and around the Atlanta Metro Area. Moon lighting mimics the light of the full moon. It creates the appearance of bright moonlight shining down on your landscape. For homeowners in Atlanta, moon lighting accents and enhances elements in their outdoor landscape. For commercial buildings and landscapes, it brings attention to unique landscape features and provides beautiful and subtle ambient lighting. To achieve its distinctive appearance, moon lighting is placed high in trees. Light flows through the branches which create the effect of the full moon shining through the foliage. It is also possible to vary some aspects of moon lighting to create different and unique visuals. The number of fixtures used has a substantial effect on the type of light produced. It both effects the overall brightness and the amount of shadow. In a standard setup, fixtures are spread just wide enough apart to shine equally across the entire area to be lighted. However, fewer fixtures or more directed fixtures can leave larger areas of shadow for a more night-like effect. This is perfect for areas that don’t need a lot of ambient light and are only using the moon lighting to highlight features of the landscaping. The type of light that is used can also change the final effect of moon lighting. The most common kind of light for moon lighting is cool light in the 4000K range. 4000K is noticeably cooler than the typical 3000K used in most outdoor lighting. However, it more accurately simulates the light of the moon, which is often described as silvery. Despite the true-to-life quality of cooler light, many moon lighting setups still use 3000K light. In this case, the placement of the light fixtures remains the same, which maintains the dappled look moonlight. But the slightly warmer light mixes more harmoniously with the light in other parts of the outdoor lighting configuration. Night Vision Outdoor Lighting designs, installs, and repairs lighting systems for clients across the Metro Atlanta area. When installing lights for moon lighting, Night Vision always uses tree-friendly techniques. We never attach fixtures or wires directly to a tree. We take every precaution to prevent tree damage such as scarring or wounds. Because a burnt bulb or broken fixture can significantly detract from a home’s appearance, Night Vision also offers maintenance and repair services in addition to design and installation. Night Vision Outdoor Lighting carries out moon lighting installation and all other Atlanta landscape lighting projects with the highest commitment to customer satisfaction. For more information about moon lighting or Night Vision’s other outdoor lighting services, contact us.